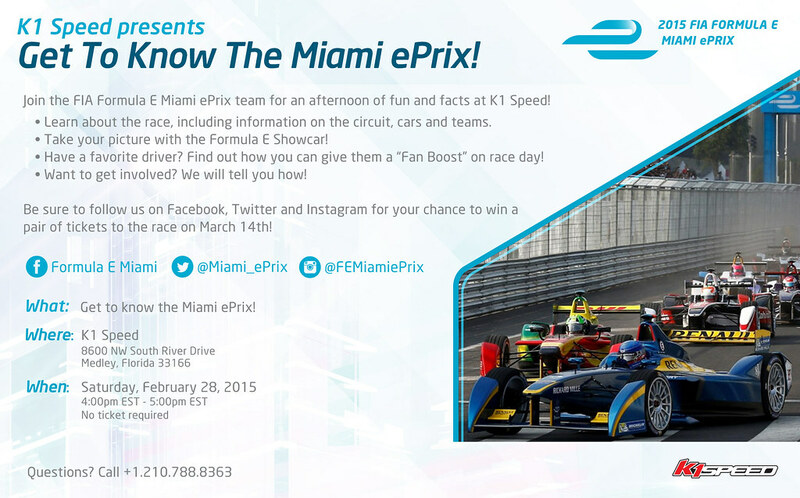 Join us Saturday, February 28th at K1 Speed Miami, as Formula E Miami representatives will be on-site to discuss the ins-and-outs of this new and amazing phenomenon that is the FIA Formula E Championship! We’ll discuss the following: the series itself, the Miami ePrix, series interactivity, such as the Formula E Fanboost, and much, much more! Also, stay tuned to all of our social media channels, as we’ll give you the opportunity to attend the 2015 FIA Formula E Miami ePrix for yourself, beginning next Monday. 8600 NW South River Dr.